Meat facts, an information sheet for kids cooking activities. Meat facts and general information about meat. 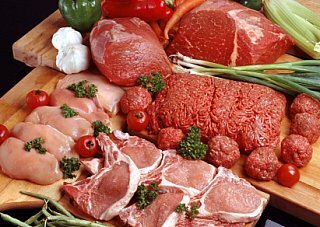 Meat includes fish, beef, poultry, pork, and wild game. Beef includes steak, beef roast, ground hamburger. Pork includes ham, pork chops, pork roast, bacon, sausage. Poultry includes chicken, duck, turkey and other birds. Meat provides protein and other nutrients our bodies need. Pick meat that is lean and cut off excess fat before using. Cooking meat and fish dishes is best for you when baked, grilled or broiled and not fried. I love using a George Foreman Grill for cooking meat. 5 oz. a day, about the size of the palm of your hand. Store meat in fridge or wrapped tightly in the freezer. Never leave meat out for long periods of time. Make sure you wash counters and any dishes and utensils well after touching raw meat. If you need recipes for meat dishes visit our Easy Kids Meals page for ideas. Divide bread stick into three, then cut down center of bread stick and dig out most of the white bread so your left with all but the crust. Cook onion til brown then add mince. Then after mince is brown add carrot and soy sauce. Place meat in breadstick and top with avocado, sliced tomato and grated cheese. Then place under grill until cheese is melted. Get a grown up to cook the hamburger meat. Get out a large plate, then place the crunched up taco shells on the bottom. Next, put Lettuce, Tomatoes, Refried beans, and cheese onto the chips. Next put the salsa on top of the salad, finally stick the salad in the microwave for 45 seconds. Get out of microwave and enjoy. Get 2 chicken breasts then flatten them out on top of some cling film, with a rolling pin. Then put some Stilton cheese in the middle and carefully roll it up. When rolled up wrap the bacon around the rolled up chicken breast. Cook on 160 degrees for 35 minutes. Finally take it out of the oven and EAT IT !